Hey if take the 2.20pm ferry can go for late entry? teamloyang01 wrote: Hey if take the 2.20pm ferry can go for late entry? just curious to know the date for LWPS X ? thanks... a lot. Pokerstars Team Asia Pro Bryan Huang will be coming to play and say hello to the kakis! 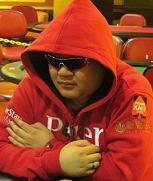 ikelos wrote: Pokerstars Team Asia Pro Bryan Huang will be coming to play and say hello to the kakis! Hopefully there is next time. Hey, there's a free roll stated on July 23rd at 12pm. I don't see it under Tournament>Regional, would someone point me in the right direction? peterparker wrote: Hey, there's a free roll stated on July 23rd at 12pm. I don't see it under Tournament>Regional, would someone point me in the right direction? Freeroll is running on the cruise and not on Ps client my friend.